Feel the romance of Venice without leaving your home when you light up candles on the elegant and artistic handcrafted Murano Glass candle holder. 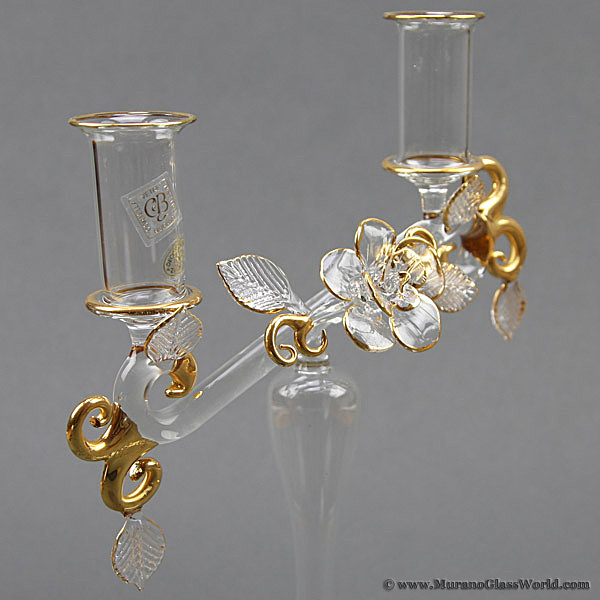 A fine example of famous Murano Glass artistic tradition, this blown Venetian candlestick made entirely by hand combines famous Murano Cristallo glass of unique translucency and purity with gorgeous exquisite floral motifs richly accented with 24K gold to add opulent Venetian feel to any room of your house. 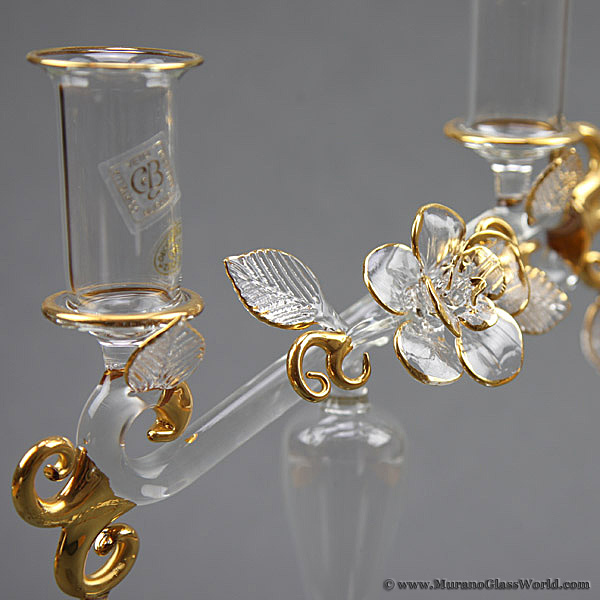 The central rose flower with its gold trim is icredible detailed and feels alive. This beautiful authentic Murano Glass Candle Holder was painstakingly created by hand using only traditional glass-making methods by the world-famous Murano maestros, whose work is displayed at exhibitions, in private collections, and museums worldwide. As such, it is much more than a functional piece of home decor, it is a piece of art - ornate, translucent, delicate, and almost weightless as only authentic Murano Glass can be. The candlestick is signed by the master and is accompanied by the certificate of authenticity. Exquisite Venetian candle holders featuring ancient glass-making techniques make a perfect gift for anyone with appreciation for European flair and Italian style. The Murano Glass Candlestick is 11 1/2 inches tall and 9 inches across.